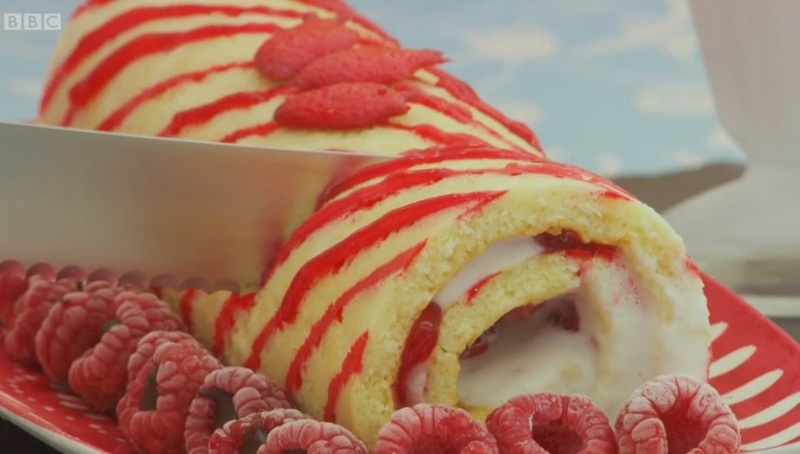 The Great British Bake Off has followed the same format of episode themes for a few years now, so it was great to see it move with the latest food trends and have a ‘free from’ themed episode this week. 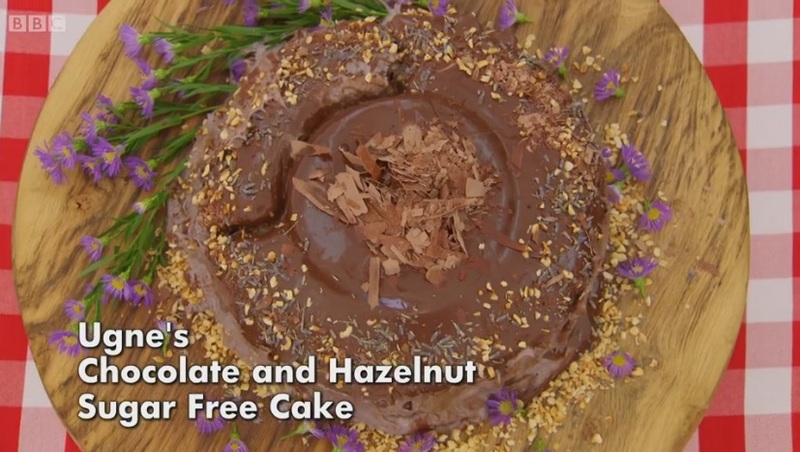 The bakers started with a sugar free cake, however it was more accurately a refined sugar free cake as the bakers could still use honey, agave nectar, maple syrup etc. All of the bakers were still reeling from Ian’s repeated star baker victories, and it’s clear to see that they have all decided to change their tactics in order to knock him off the top spot! A lot of the bakers used fruit to sweeten their cakes. It was nice to see Ian make a more ‘normal’ flavoured cake, he used pear, ginger and honey for his cake. Although the judges didn’t think it was sweet enough and Paul thought the pears were the wrong choice. Mat made a carrot cake using honey and dates for sweetness and also flavouring it with spices. 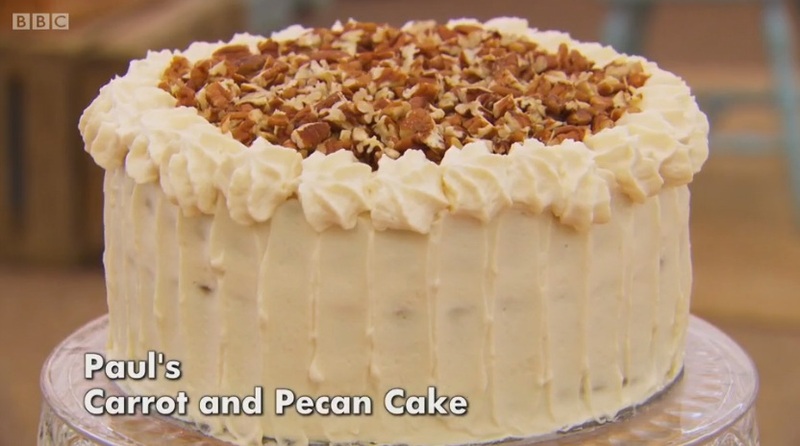 Paul also went for carrot cake but instead used agave nectar and sultanas for sweetness and added pecans. The judges liked both carrot cakes. Honey and grapefruit polenta cake was Tamal’s effort and he got his syringes out again to inject grapefruit syrup into it. The judges were big fans. Alvin went for a classic pineapple upside down cake using agave nectar for his sweetness. He was very worried when he finished his bake about 45 minutes before everyone else, but the judges loved it. Paul called it superb and Mary said it was the perfect balance. 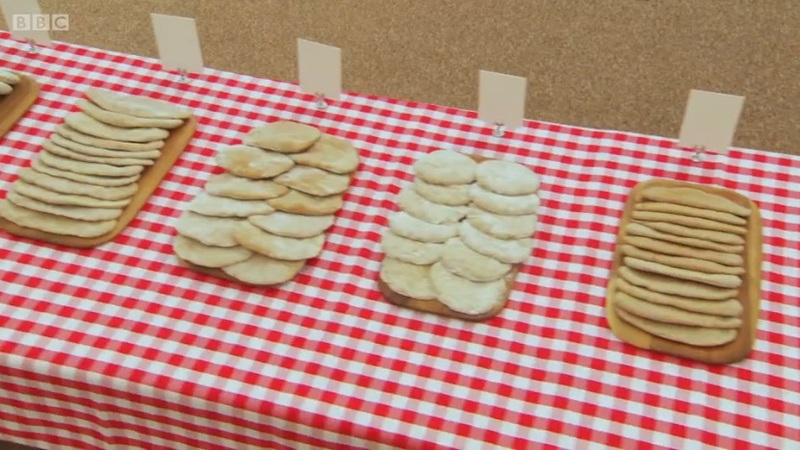 Ugne gave herself a big challenge by making her cake gluten free as well and giving it a checkboard pattern. Unfortunately it didn’t work out for her as her cake broke and her icing melted. Flora made an extremely pretty pistachio, apple and cardamom cake, which she decorated with madelines. 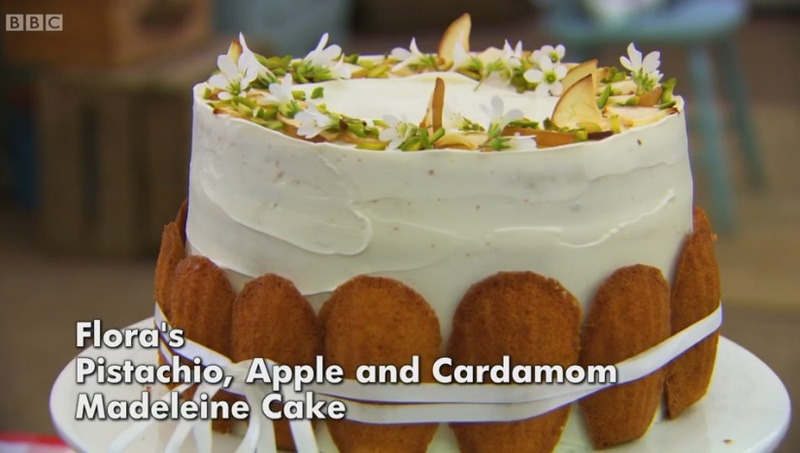 The judges thought it looked really good, but that the cake was over moist and stodgy. Nadiya was the only one to use mulberry molasses for her sweetness, and she also made a blueberry sugar free jam using basil seeds. She used a genoise sponge which the judges said was too dry, however they were impressed with her flavours. 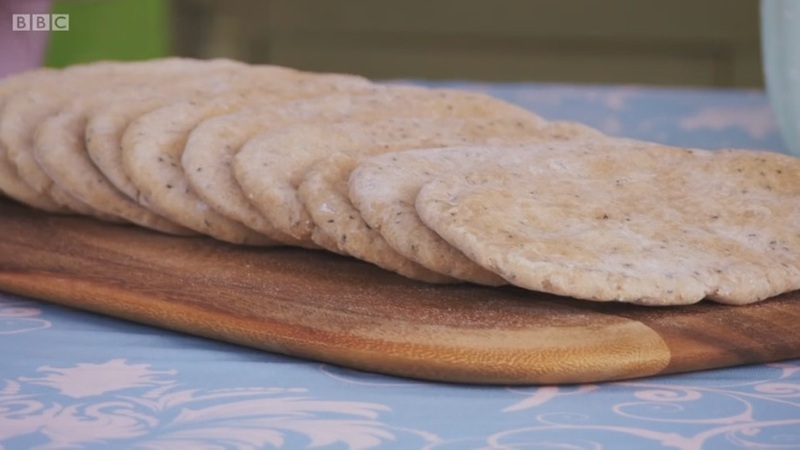 Gluten free was the technical challenge and the bakers were asked to make 12 identical gluten free pittas. And they only had 2 hours! They were all given some psyllium powder which is gluten free but creates a gelatinous brown mixture to replace the lack of gluten. The bakers all said it didn’t smell very nice! Alvin wasn’t sure what shape a pitta should be and had a triangle in mind for a while, thankfully he realised it should be oval shaped! None of them knew how long to work the dough for or how long to prove it for. There wasn’t much confidence in the tent at all and they all seemed nervous and confused. Alvin came last, Tamal 7th, Ugne 6th, Ian 5th, Mat 4th, Flora 3rd, Paul 2nd and Nadiya 1st. 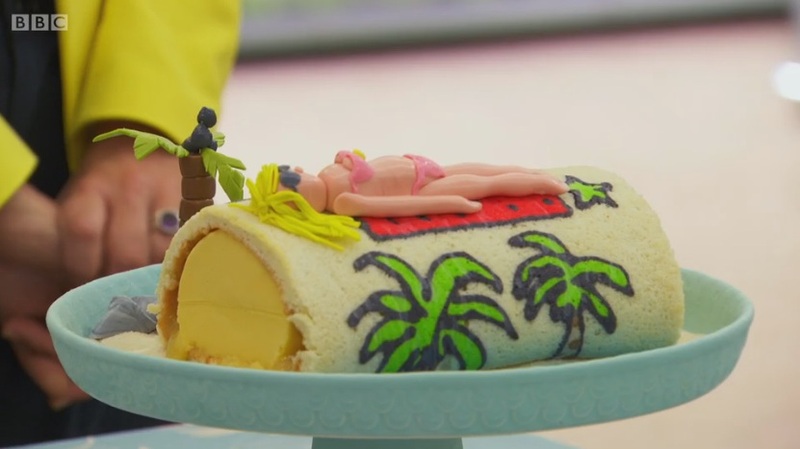 The final ‘free from’ challenge was the showstopper and the judges requested a diary free ice cream roll containing silky smooth ice cream covered in jam, then wrapped in sponge. Mary wanted to see outstanding results from the bakers. Paul wasn’t planning on holding back with his opinion at all! I have to say I was incredibly relieved to see they all had ice cream makers, plus extra freezers at the end of each bench. The BBC were clearly planning on not having another ice cream fiasco! Everyone used coconut milk for their ice cream which inspired a lot of tropical flavours. Alvin used buko pandan, a traditional Phillipino flavour, alongside mango and passion fruit. Paul went for mango, lime and coconut ice cream with a pineapple jam. He also made a fondant bikini clad girl which created some hilarious moment with Mel and Sue as they advised he give her bikini bottoms a gusset, so funny! Tamal made passionfruit ice cream and also pineapple jam. 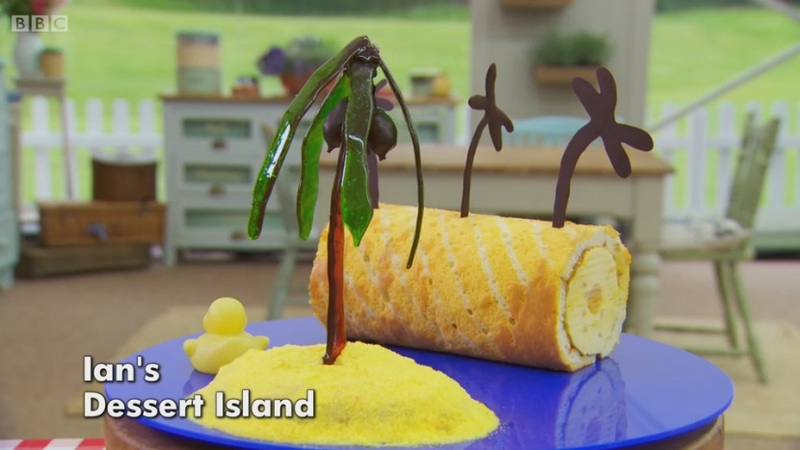 Ian made a mango and stem ginger ice cream, and decorated his roll with a very clever caramel palm tree embedded in marzipan. Mat made a faux pas by deciding to roll his ice cream like a swiss roll, instead of rolling the sponge around a log of ice cream. This meant he didn’t have much ice cream when he presented it to the judges. Flora also went off piste and made a buche using a very thin chocolate sponge, pear jam and vanilla sponge. Unfortunately the judges weren’t entirely impressed by either of their efforts. Ugne made peanut butter ice cream, grape jelly and a chocolate roll. The judges weren’t convinced by her flavours, but Paul loved her ice cream. She put her jam inside her ice cream though, which prevented it from freezing properly and she ended up with a melted mess. 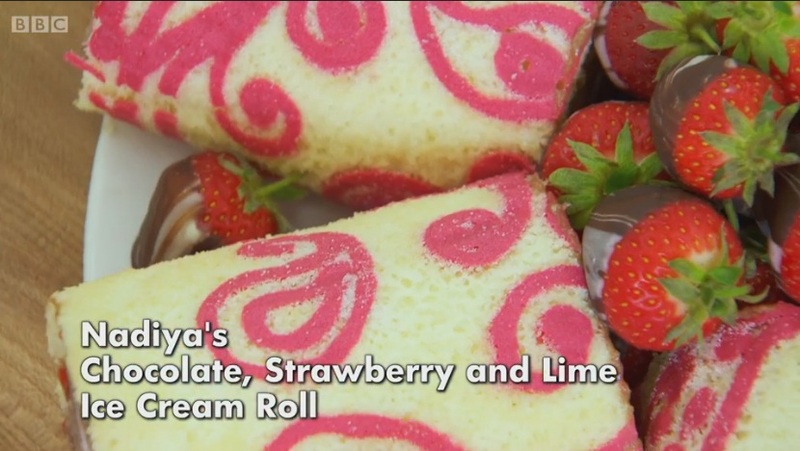 Nadiya made chocolate ice cream filled with a strawberry and lime mousse. She used a beautiful henna inspired pattern for her sponge. Mary and Paul were very impressed and loved her ice cream and patterned sponge. Ugne left us this week after suffering two melted bakes. She was very gracious and vowed to continue baking and experimenting with her flavours. Star baker was awarded to Nadiya this week and you could tell how much it meant to her. Next week – pastry and soggy bottoms! Personally, I don’t really see the point of having a sugar free cake. Don’t get me wrong, I think you should watch the amount of sugar in your diet and eat it in moderation. 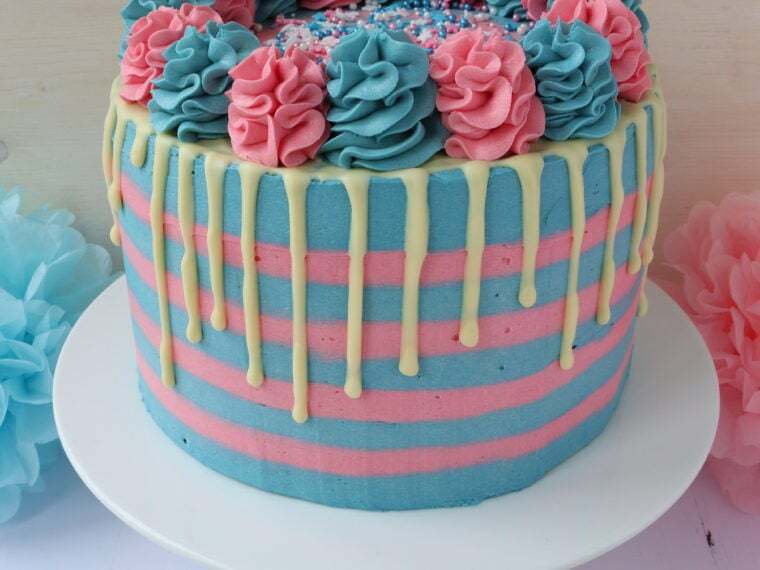 But cake is a treat, and if you’re going to have it, you may as well have one full of sugar, butter and whatever else you fancy! I’d rather eat less cake, than eat more cake but some of it be sugar free. For the purpose of my GBBO bake along, I decided to make these Sweet Potato Brownies. They are something I’ve wanted to try for a while. I didn’t make them dairy free or gluten free, but there are recipes out there (Deliciously Ella’s one is popular) that are. I didn’t add any form of sugar to the sweet potato brownies as I wanted them to be truely sugar free. I started by grating sweet potato. I did it by hand, but you could use a food processor too. In a bowl I measured out self raising flour, bicarbonate of soda and cocoa powder. I melted butter and mixed in semi skimmed milk and vanilla extract. I added the butter mixture, eggs and banana to the flour. I mixed it really well. Then I added the sweet potato and mixed it in. I poured it into a lined baking tray and baked for 30 minutes. It was really hard to tell when it was done as it didn’t look like a normal sponge! Ok, so the sweet potato brownies weren’t bad, but, well, you guessed it… they just weren’t sweet enough!! The banana certainly helped add flavour and very mild sweetness, but for me I just wasn’t feeling it. So I made some icing. I mixed together cream cheese, butter and honey. I squeezed the moisture out of the cream cheese using a muslin cloth first, I saw Paul doing it for his carrot cake and I have to say it really does make a difference. This icing is optional, if you really like the Sweet Potato Brownies on their own then you don’t have to add it as it does contain honey which ultimately is sugar. The way I like to see it is that I’m eating less sugar than I normally would if I’d made a regular brownie, plus there’s the additional health benefits of the sweet potato and banana. My boyfriend much preferred the sweet potato brownies with the icing, as did I! It gave them that extra edge they were missing. The sponge was a different texture than I was used to, but I liked it. I think the main hurdle with anything like this is getting over your normal expectations and accepting that a sugar free Sweet Potato Brownies is not going to taste like a normal brownie! I completely agree! I think Mary Berry has the same theory too so it must be right! Oh wow your Sweet Potato Brownies look awesome – thanks for a fab #CreditCrunchMunch entry. Thanks Camilla! Glad to be part of the challenge. Interesting to hear that about the Deliciously Ella recipe as it had rave reviews when I read up on it. These sweet potato ones were really easy to make so I do recommend giving them a go! When Mattt delivered his roll to the judges and said "I thought they were the same thing" I laughed because I did the same bloomin thing. These sweet potato brownies have intrigued me, I'm having to experiment a lot with things like these as my dad recently discovered he was diabetic and so everyone in our family has been cutting back on normal cakes and trying out lower sugar alternatives. I think these look great, but i know what you mean, you taste the lack of sugar and I've found the things I've made so far that are sugarless or alternative aren't as fluffy as I'd like. Free from cake just can't win against regular cake! But these brownies do have a great fudgy texture so I'd recommend giving them a try, but don't skip the icing as they do need it to give them that extra punch! I'm not a fan of beetroots at all Helen so I wouldn't put it in cake either, sweet potatoes were surprising ok though and I've also used courgette in muffins before which works really well!